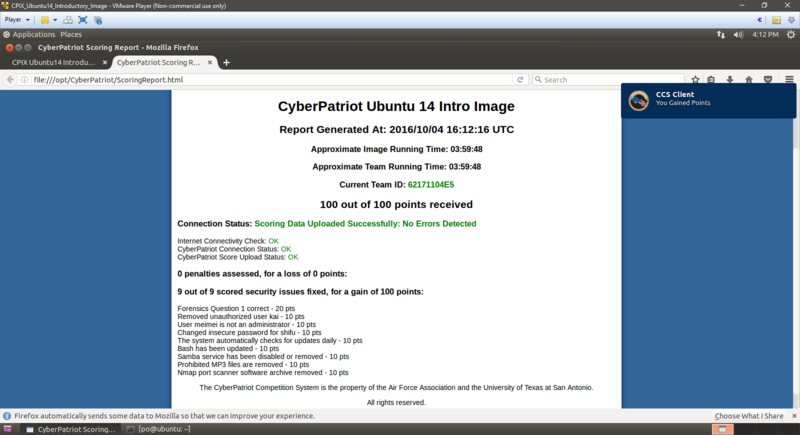 Following on from the initial images for the 2016 – 2017 CyberCenturion competition, the Ubuntu images were available earlier this week for everyone to have a go with. While I can complete the Windows images and fix them pretty quickly, I’m not so good on the Ubuntu ones – some of the students are though. Me: Have you checked for updates? Student: Yes, there weren’t any. Me: Are you sure there weren’t any? Me: So, a two year old operating system has absolutely no updates needed, despite this being a competition about security? Me: So, in the sshd_config file, you should see a line that says “PermitRootLogon” with a value of “without-password”. Do you think this is a good idea? Me: Right. So, what should go in place of “without-password”? Me: Not quite, we don’t want to allow it. Me: Sort of. Remember we don’t want to let anyone log in as root. Student 3 Is it no? Me: Yes! Did you catch on that I kept saying the answer as well as saying the guesses weren’t correct?